Purchasing major appliances that are energy efficient as well as water efficient reduces your impact on the environment. It passes savings onto you, too. Few of us never imagine purchasing a major appliance when the current one is still running. But when you consider how your present refrigerator, dishwasher, or washing machine is impacting your life and the world in general, you may begin to have a different opinion. Think of your current appliance as that toxic friend or partner who is dragging down your life in ways that you sense subconsciously but cannot quite define. When you re-frame the purchase of a new and more efficient appliance, not as an indulgence or a luxury, but as a highly practical solution to an urgent matter, everything seems to fall in place and make more sense. 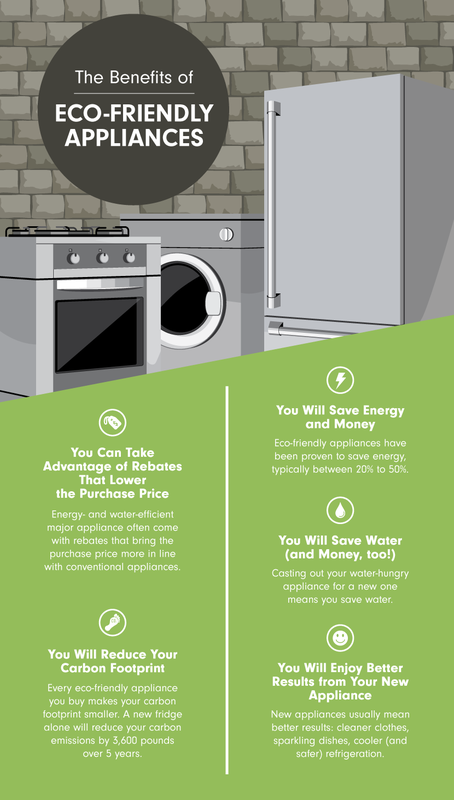 After that initial cost to purchase the new, eco-friendly appliance, everything that follows is a benefit. All smart eco-friendly major appliances use less energy than their not-so-smart ancestors—that is one cornerstone of eco-friendliness. Newer technology in these machines will help slow your electric metre to a crawl. Also, simply by virtue of updating parts like door seals, fans, and compressors, the new machine will work smarter, not harder. Saving water is the other cornerstone when it comes to efficient dishwashers and clothes washers. Manufacturers of both types of machines help you reduce water consumption by introducing smarter technology that produces the same results with less water usage. As one example, it is estimated that an Energy Star clothes washer can save you 3,000 gallons of water per year and still produce clothes that are as clean and even cleaner than before. Your impact on the environment is greatly reduced by purchasing major appliances that are efficient with water and energy. It is estimated that over a five-year period, you can reduce your carbon footprint by 3,600 pounds by purchasing an Energy Star-rated refrigerator. When you recycle your fridge, too, you keep refrigerant and insulating foam out of landfills. It is common for local utilities to offer rebate opportunities for those purchasing a certified machine. Clothes dryers, washers, dishwashers, refrigerators, and even light fixtures are examples of items that may come with offers for post-purchase rebates. In addition to those savings, you will most likely get better results from your major appliance by upgrading it. For example, newer clothes washers can spin your wet clothing faster and harder, resulting in less water for your dryer to dry out. Be energy efficient on the small scale, too! Scared to jump in the energy-efficient appliance water? Wade in slowly by making small scale changes that cost only a few bucks yet return equal or greater bucks’ savings. Better yet, combine these modest changes with the purchase of an eco-friendly appliance and get your entire house on the bandwagon. Touch your finger to an incandescent bulb and feel the difference between that and a cool LED bulb. LED bulbs use from 70 to 90 percent less energy than incandescent bulbs. If everyone in the U.S. switched from incandescent to LED bulbs, an estimated 17 billion pounds of carbon would be saved each year. If your toilet was installed before 1994, it probably is the water-wasting 3.5 gallon-per-flush (GPF) type. Switch to a 1.6 GPF toilet and save up to 4,000 gallons per person per year. Advancements in toilet tech mean that you still get the same flushing power for less water. Remove your current shower head and replace with one that has a WaterSense label. This reduces your gallon per minute (GPM) consumption by a half gallon. Some communities offer free energy audits to qualified residents. Or you can purchase a small device, such as Seek Thermal, that clips into your phone’s USB slot and allows you to thermal image your house on your own. If you are still using a desktop computer, look into cooler-running laptops. Desktop computers gobble an estimated 60 to 250 watts, as opposed to laptops’ substantially lower consumption level of 15 to 45 watts. What do you think of this article? Share your thoughts with us at hello@cromly.com.